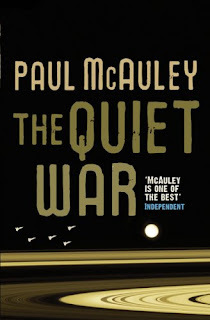 At last week's meeting of the Chicago Speculative Fiction Community, we discussed Paul McAuley's "The Quiet War" (2008), a relatively near-future science fictional tale wherein humans have spread a bit throughout the solar system, and Earth-based interests are rapidly headed towards a military engagement with the fairly anarchic societies of the Jovian satellites. Before we got talking about the novel, we got some reports from Worldcon--we had three attending members who gave us some highlights from Spokane this year. That in turn led us to talk a bit about the Hugos, the preponderance of "No Award", and the whole Puppy kerfuffle. Also: fire! Spokane was apparently inundated with smoke from (relatively) nearby forest fires for a few days. But! 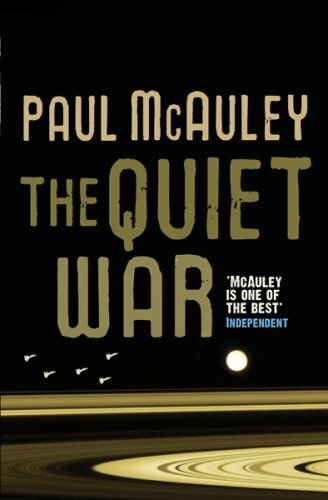 "The Quiet War". I was so pleased to come back to this book--hadn't read it since it came out, and forgot how enjoyable it was. Possible spoilers below! The general consensus was that we all quite liked this! It's delightfully, definitely SF. Perhaps even "Hard SF", and perhaps even "Mundane SF" (in the sense that there aren't aliens, all the tech seems relatively believable, there's no magitech or handwavium). And we really liked that it stays within the solar system, uses the alien-ness of actual bodies in place of imaginary ones. One complaint is that the novel doesn't really have much of an ending. A valid point, although I pointed out that the whole thing isn't terribly plot-driven, instead following several different threads that are caught up in the same events but not following a normal dramatic arc. I like the notion of "future historical novel" for this, which I've heard used for other wide-angle space opera (like Cherryh's). We particularly liked the plausibility and depth of the biological/ecological scenes. We praised the complexity of the politics and motivations--Bill pointed out that there are people on both sides with good, rational reasons for their actions. Kim thought there wasn't enough motivation/development for the characters, and thus even though the book is good didn't feel motivated to explore the sequels--no characters she wanted to follow. She also pointed out that pilot Cash Baker is a delightful throwback to the kind of military/engineer/competent man from Golden Age SF. I read this whole novel as kind of about the importance of checks and balances--all the tragedy & violence in the book stems from the lack of justice, order, and rights, essentially. The Earth powers are feudal oligarchies, the Outers' "anarchies" have often devolved into tyrannies of the majorities or personality cults, because they don't have the legal/political/social structures to resist either. I'm fascinated by--but don't know what to say about--the dynamic of scientists and science in this book. We don't see quite enough. But there's this weird thing with extremely powerful scientists, whose discoveries can lead to both peaceful or military ends, pursuing the science and their own projects in a kind of apolitical or even amoral way. Reminded me of von Braun, and also many of the political aspects of key figures in the Manhattan Project. Three big SF things "The Quiet War" brings to mind--the "future historical" & realistic mil-SF-ishness of Cherryh (particularly the Daves, clone soldiers who REALLY remind me of a few of her azi characters), the gritty/seemingly-amoral critique of power structures in Gibson, and the complex political machinations and palace intrigues of Herbert. All good things to be reminded of. I love a last stand. I was a little bummed that the last days of Paris, Dione, are portrayed in a relatively negative light. I was reminded of Vonnegut's wrenching (non-fictional) account of the last days of Biafra, and also the revolution at the end of Mieville's "Iron Council" (2004). One scientific critique I had: McAuley seems to think that space is cold. Note: guy freezing on Titan is totally legit though, because Titan is terrifyingly cold. Jason gave a shout out to Dreampod 9's Jovian Chronicles SF game setting, which he's done some work for-- has many similarities to the setting of "The Quiet War". We talked for a bit about religious aspects in the novel--the fusion of Catholic and "Gaian" beliefs, and the brainwashed/culty "Ghosts". A few of us thought the "Great Family" structure of Greater Brazil was "completely unbelievable", while others among us thought it was "barely an exaggeration" over our current elite's control of the political system. So, mixed thoughts there! Anne also pointed out how society/popular opinion being hijacked for a war fought under false pretenses echoes current/recent military engagements such as the Iraq wars. We liked Newt and the fairly subtle characterization there--a bit Han Solo-ish at first glance, but deeper. The good ship Pink Elephant made a few of us groan, but also gave us an excuse to talk about beer and that terrifying sequence from "Dumbo" (1941). We debated for a bit about some character motivations, particularly Sri's, and whether or not Loc is more than a moustache-twirling villain caricature. One thing we did agree on is how well McAuley does action--James Bond action movie-esque. A good discussion as always! The next pick for Chi-SF is Neal Stephenson's "Seveneves" (2015).